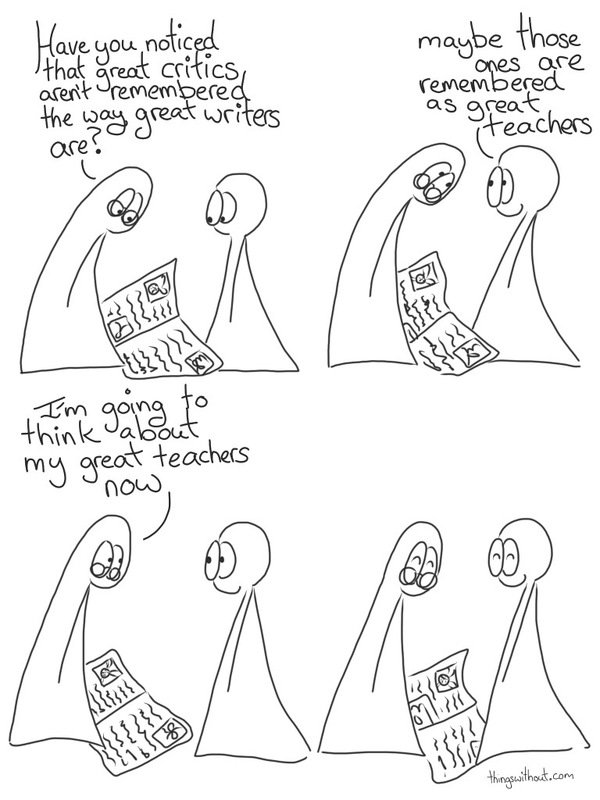 This comic is dedicated to all the amazing teachers, mentors and educators out there. This comic’s inspired by a conversation I had with one of my favorite teachers over a decade ago, Simon Haines. He’s one of those teachers who is so infused with love (and articulate in that love) of literature and exploring ideas that you can’t help but get swept up (at least if you’re not me). He might be a little bit concerned by some of my grammar in this paragraph, I’ve never been good at the rules. I study the rules with interest (I don’t know how many times I’ve read Struck & White, and the AP Style Guide) and then promptly forget them all and go back to throwing paint to make pretty mind pictures. Anyway, more than half my English units were with Simon. I knew I would be inspired, my brain would stretch and I would come out of it with an increased/new love for the text studied. Dr Haines was not the sort of person to deaden your love for a work, instead he’d make you go OMG the Iliad is such a crazy boys adventure, Le Mort d’ Arthur is HILARIOUS! He developed courses that challenged the status quo in some parts of the English department and exuded a kind of good human decency that were like little rays of sunshine on days grey misery. I’d love to hear about some of your favorite teachers. There’s something marvelous (and all too fortunate) about recollecting and sharing memories of those teachers who inspired us.